People who say that guitar rock is dead clearly ignore the talents of Jack White and his various projects. 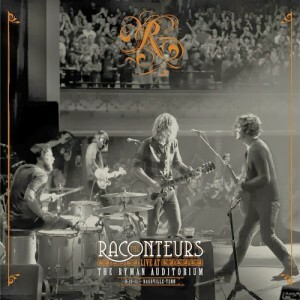 It’s been six years since The Raconteurs’ last studio album and nearly as long since they last played a show together, but Live at the Ryman Auditorium is a great reminder of a band that could do with more material soon. There isn’t much banter or interaction with the audience here, but if the screams are any indication, the fans didn’t mind one bit. From the back and forth singing and jamming in “Level” to the horn embellishments on “The Switch and the Spur,” it’s clear that this was one hell of a special show. The thirteen-song set is upbeat and energetic, filled with plenty of showy guitar that doesn’t feel excessive. These are just guys who know how to rock, and they’re not pretentious in sharing that. “Broken Soldier Boy” feels like it’s straight from the Led Zeppelin playbook, while the Brendan Benson-helmed “Many Shades of Black” has a touch of theatrical drama. Listening to this record made me miss the prevalence of guitar rock. With any luck, The Raconteurs will soon make their return. If that never happens, we’ll always have the memories here.